Flood in front of Darul Jannah Mosque in Taman Kota, West Jakarta. (23/10/2016). I always say to anyone that being a journalist is an opportunity to see reality. The real reality. It came across to my mind – again -when I cover a story about Mr Anies Baswedan’s campaign in Taman Kota, one of the densely populated residentials in Jakarta. It was raining for 3-4 hours and continued until I arrived in Taman Kota. It was Sunday but everyone seemed lazy to get out from their crib. Although there were some banners and knick knacks representing Mr Anies’ taglines. The rain won’t stop even until Mr Anies and his team arrived in Taman Kota. 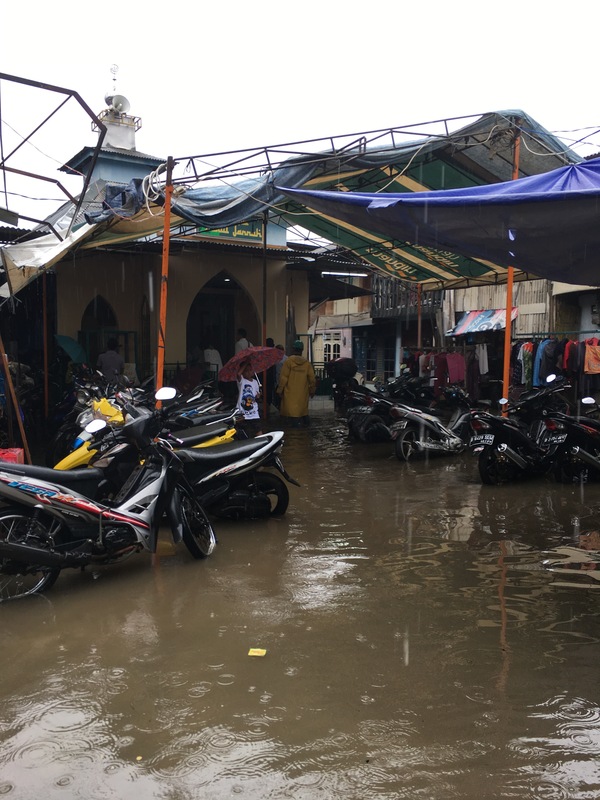 Some parts were flooded including a small mosque that used as a place for face to face discussion with the resident of Taman Kota. Without any single doubt, Mr Anies walked through the flood. He used a pair of Swallow slippers. Mr Anies and other candidates of elections rally might experience how hard it is to be living in a flooded and populous places but only for some hours or maybe less. They got all the tiny things prepared. And they are unlikely to hear things as many as the journalists may hear. – Preparing the content: read the running news, discussing the editorials with the coverage coordinators. Then preparing the equipment together with the cameraman. – search for the exact locations. If he/she is lucky no Google Maps needed. Sometimes he/she needs to stop several times to ask the locals. – doing an informal dialogue with the locals. I always try to apply this one. Why? It’s a journalist job to cover both sides: the candidates and the locals. Sometimes it also deals with more than 2 sides. E.g. The regulator sides (KPU, local government, etc). In informal dialogue, many things become uncovered. Why Taman Sari’s resident hate Ahok: because they’re afraid to be the next target of eviction. Why they’re having a small believe in Ahok: because they believe their area would be free from flood. Why they like Anies: simply because he visit their area. They want to be heard by the influential person. Anything else? Because he keeps visiting though their place were flooded. Their answers might be different if one of those criteria changed. Meanwhile, the dialogue between the candidate and the residents is taken for granted. The candidate comes to hear the problems and promise to give the solutions. I’m not trying to say that every politician should spare their working times to visit every single village and get some coffee or anything. What Jokowi or Ahok did with blusukan is more than enough. What I’m trying to suggest is that my job gives a rare opportunity to reveal the real reality on the ground. There are too many realities to be articulated even though some of them have been delivered on the television screen. Thus, I’m committed to bringing them using texts. Perhaps not regularly published but I keep trying to compile them.